Archer Out..Jones In? Great Move By Steelers..”Period”! | "IT'S A STEELERS WORLD"! Archer Out..Jones In? Great Move By Steelers..”Period”! What’s the best way to keep Mike Tomlin from competing on “Dancing With The Stars”? Make sure that himself and his dance partner stay relevant. The Pittsburgh Steelers have made another roster move, claiming San Diego Chargers receiver/return man and former Baltimore Raven, Jacoby Jones off of waivers and releasing Dri Archer. A move that I never saw..nor imagined coming, but one I agree with highly. And trust me, those are not the only spectacular returns by Jacoby Jones. In fact, Jones has had a couple of 100+ yard returns, something that Dri Archer has not. Which basically tells me one thing..and one the only..”The Steelers Want To Win”! No more mediocrity..no more close losses..no more falling to lesser teams. 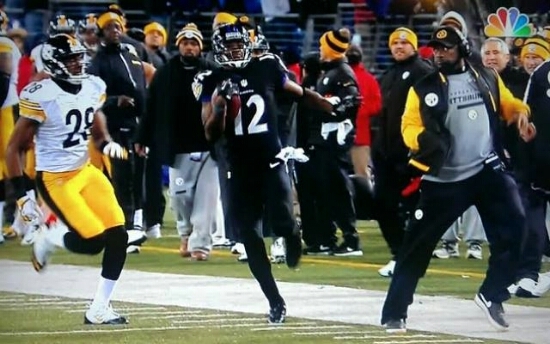 Field position helps you win games..and that is what Jacoby Jones will help them to achieve. Jones, 31, was waived Tuesday by San Diego, just eight games into a two-year deal that he signed in March. He previously played for Baltimore and Houston.